Andrei Osipov, who took part in 26 March protests in Cheboksary, is detained during an orchestral recital on 31 March. Source: Sergei Zakharov / Youtube. We continue our partnership with OVD-Info, an NGO that monitors politically-motivated arrests in Russia. Every Friday, we’ll bring you the latest information on freedom of assembly. On the same day, there were further arrests in Moscow in connection with five different events, and practically everybody who was arrested was questioned (and threatened) by investigators working on this new case. That said, all the investigators’ questions concerned 26 March. And on 6 April, the Investigative Committee had already announced that a suspect was in custody. The authorities have not limited their response to administrative prosecution of people involved in protests against corruption, whether they’ve been arrested or not. For example, in Chita, FSB officers called the mother of the protest organisers and asked her to “sort her son out”. In Rostov, local police came to the home of a protest participant with a summons. In Saratov, police visited a protest participant at their institute, and in this same town, where there were no arrests on 26 March, the police have promised to act against one hundred protesters, and even summoned one activist to a police station from his mother’s telephone. In Chelyabinsk, police officers kept watch outside the home of one activist to make sure he didn’t attend the action on 2 April. In Krasnoyarsk, Siberia, people have been called up by the police and questioned about corruption and Alexei Navalny (including people who didn’t even attend the protest). In Orsk, detectives visited one activist at home. 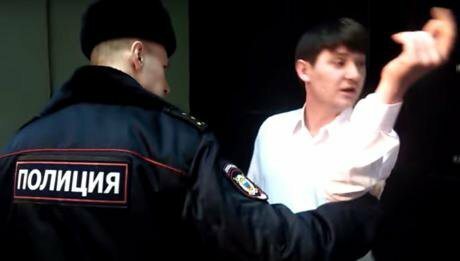 In Cheboksary, one protest participant was detained during the middle of an orchestra rehearsal. And here, protest participants have lost their jobs and places at university. In Russia’s Far East, school principals are being asked to ban pupils from attending opposition meetings. Andrei Ospiov, who took part in anti-corruption protests on 26 March, is arrested during an orchestral rehearsal. Given this response, it’s a relief to report that some cases have been stopped. In Arkhangelsk, the police have stopped their case against activist Marina Venchikova, who began to feel ill after being arrested — she was taken to hospital, and then sent to court. In Nizhny Tagil, the police have stopped their case against Andrei Batorin, who livestreamed the event via Periscope. And in Khabarovsk, protest participants have been vindicated after it turned out that a notice informing the mayor’s office of the upcoming protest was, indeed, sent. The truckers’ protest has annoyed the authorities no less than anti-corruption protests (perhaps even more). In Dagestan, interior ministry and national guard troops have been surrounding the truckers’ demonstration. Across the country, truckers have been detained for holding pickets, as witnesses into criminal cases, summoned to police stations, fined for demonstrating, and have had their trucks tampered with. Other demonstrations have also left the authorities unimpressed. Police detained Albert Goncharov, a Belarusian citizen, on the Moscow metro for handing out brochures “Putin.War”, the report prepared by Boris Nemtsov into Russia’s actions in Ukraine. Participants in a protest demanding that Putin should be sent to an international tribuna outside the Dutch Embassy in Moscow were arrestedl. In Kurgan, businessman Igor Putin (no relation) was fined for organising a meeting outside a district administration building against plans to place a landfill site nearby. And one Moscow activist, Pavel Kuznetsov, was fined 150,000 roubles (£2,100) for hanging out a banner saying “Putin is war”. The day before the mysterious protest on Red Square (which in the end didn’t happen), Mark Galperin, one of the organisers of the opposition walks, was detained and placed under arrest for 15 days. Ildar Dadin, a recently released political prisoner, was refused an international passport for his involvement in “unsanctioned politics”. Politicians’ meetings with voters can also be declared “unsanctioned” now — at least, that’s what the Duma believes after passing the first reading of a new bill that would make it compulsory to receive permission for such events. The next day, Alexander Andreev, a member of Moscow’s municipal assembly, was detained at a meeting about the demolition of apartment blocks. And in Voronezh, city authorities have used the Petersburg metro attack to introduce limits on holding any demonstrations in the city. Ruslan Zeitullaev, a resident of Sevastopol who’s on trial for membership of Hizb ut-Tahrir for the second time, has gone on hunger strike. In Moscow, it seems that a “26 March case” is coming, and meanwhile, in Crimea, the “26 February case” continues. Mustafa Degermendzhi and Ali Asanov, two of the men charged with mass unrest in February 2014, have been transferred under house arrest. We analysed the work of the Moscow police on 26 March and our own work. The events of 26 March were discussed in depth at two seminars held at the Memorial Human Rights Center. At one, arrestees were given recommendations on how to defend themselves in court, and at the other, lawyers discussed their experiences of handling cases on freedom of expression and freedom of assembly in Russian courts and the European Court of Human Rights. Here’s some useful information for teenagers who have fallen under the authorities’ gaze after 26 March, and their parents, on what the “prophylactic register” is and how to get off it. A tool called Legal Navigator has now been released. This is a resource where you can find extracts from key legal decisions concerning freedom of assembly. Novaya Gazeta has published a photo-reportage from the truckers’ strike in southern Russia. Online resource Batenka has talked to Ramazan Dzhalaldinov, the Chechen man whose house was burnt down, sent for compulsory public works after he criticised local authorities. He was also forced to apologise to Ramzan Kadyrov. Thanks to everyone who continues to support us. Find out how you can help here. For more information on OVD-Info, read this article from the organisation's founder on how OVD is breaking the civil society mould here.